Puerto Vallarta, Mexico - Viejo Vallarta is in for an exquisite treat as European recording artists and Puerto Vallarta favorites, "The Blond Gypsies" Latcho & Andrea, will be performing their Gypsy Rumba and Flamenco style guitar music at The River Café for three nights in March. 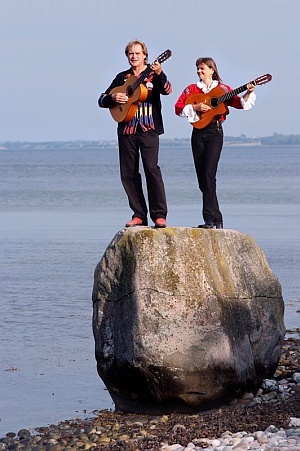 With Latcho on guitar and Andrea accompanying him with guitar and castanets, the couple have recorded eight albums and a DVD chronicling their career. Their wild, untamed gypsy style has drawn comparisons to The Gypsy Kings, Ottmar Liebert, Jesse Cook, Manitas de Plata, and Willie and Lobo. Some of the gypsy influence in their music comes from time that Latcho spent in the south of France, in the proximity of the Gypsy Kings. Before he met Andrea, Latcho and his good friend Lobo (of Willie and Lobo) played music together in Germany and in Mexico. After Lobo moved to Mexico, he sent numerous postcards back to Latcho extolling the virtues of the paradise he had found in Puerto Vallarta. But by this time Latcho and Andrea had met while both performing in a traveling show. They spent a lot of time together and fell in love while living and traveling throughout Europe with the Gypsy Clan of Circus Atlas. After three years traveling with the gypsies, Latcho reformed his Flamenco group, "Lailo." With the band, Latcho composed and played guitar, while Andrea continued with Flamenco dance and began playing rhythm. Lailo recorded four albums and toured all around Europe and Egypt, appearing on television and radio. The band was highly acclaimed and won awards for best folkloric music group. All the while Lobo continued to stay in touch, continually touting Puerto Vallarta as a paradise. They came to Mexico to visit for several years until finally, in 1996, they decided to leave Europe and moved here. For the first four years they played their music primarily in Vallarta (as there wasn’t much of a "music scene" in the North bay) and, originally, billed themselves as "Gitans Blondes," the name being taken from a brand of French cigarettes. They also used the name as the title of one of their CDs. Since then, Latcho & Andrea have been consistently performing throughout Mexico, The United States, and Europe. The Blond Gypsies are still living in Puerto Vallarta and are considered world class entertainment, delighting Banderas Bay audiences with their Gypsy-Flamenco style of music. If you have never had the pleasure of seeing these two amazing artists perform, be sure to catch them at The River Café on March 14th, 21st, and 28th. The shows start at 8 pm each night. Seats for these incredible and unique shows will surely be in great demand, so make your reservations now to ensure that you don't miss their show and a delicious dinner! Open daily from 8 am to 11:30 pm, The River Café is located at Isla Rio Cuale #4 in downtown Puerto Vallarta. Reservations are recommended and can be made by calling (322) 223-0788 or online at RiverCafe.com.mx. Click HERE to learn more about The River Café.